Q: ​The historian Robert Blake suggested that there were “great gaps” in Churchill’s knowledge, but doesn’t say what they were. Any thoughts? —M.H., Rye, N.Y.
A: A colleague who responded to this question offered a novel parallel: Dr. Watson’s first meeting with Sherlock Holmes, in the novels of Arthur Conan Doyle. Impressed by Holmes’s immense range of knowledge, Watson is amazed to find that Holmes does not know that the earth travels around the sun…. I’ve often dined out over Holmes’s remark, though in a way it perplexed me. Surely a detective’s deductive reasoning might at some time require knowledge of the Solar System? For instance, would Holmes not have needed to realize he must set his pocket watch ahead for the fateful final showdown with Professor Moriarty at Reichenbach Falls? Churchill, it appears, took Holmes’s view that the mind is not infinitely expandable. Time and again, he exhibited vast gaps in economic and financial knowledge, which his friends Bernard Baruch and Brendan Bracken made up for in his personal affairs. David Lough’s comprehensive book No More Champagne recounts the many occasions when his friends’ counsel helped to salvage Churchill’s creaky finances. 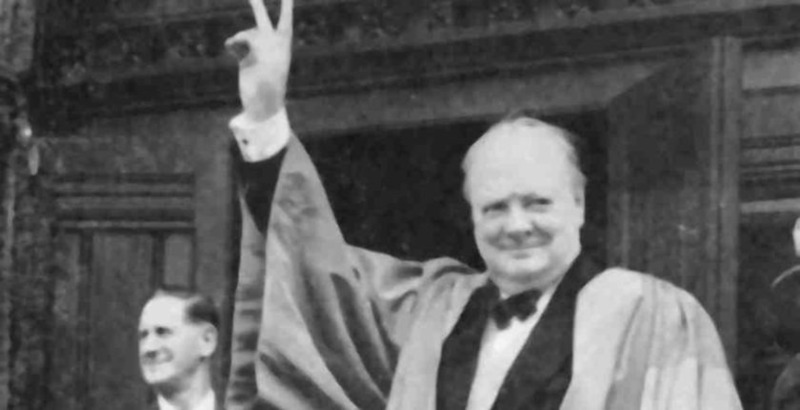 It is a curious fact that Winston Churchill, whose long career was so directly affected by events that occurred in Germany and whose place in history is impossible to define without reference to that country, knew very little about it in any formal sense. This is not said in derogation, for his relative ignorance served his people better than the prescriptions of those who pretended to be more knowledgeable in German affairs. It is nevertheless worth noting that he had small acquaintance with the Germans and their land and their culture. His visits to Germany were rare and short (two before 1914 and then no more until a brief visit in 1932); his knowledge of German was virtually non-existent (“I’ll never learn the beastly language,” he said on the eve of the First World War, “until the Kaiser marches on London!”), and, unlike his colleague Haldane, he was unversed in German philosophy, literature, art, or—because his musical sense was not highly developed—music. Churchill took the breeder for a walk round the grounds and gave a general idea of his plans; the expert then gave advice and went into more technical details. Mr. Churchill said very little. Rather like a penny dropping in the butterfly man’s mind, you could almost see him thinking, “Ah, I’ve got the old boy. He’s not nearly as clever as I thought. This is one sphere in which I know a lot more than he does.” The butterfly man then became just the slightest bit patronizing and Boomph! Churchill came back at him with some very lucid comments showing that he was well acquainted with everything being said. The expert was visibly shaken and did not attempt to “talk down” again. Churchill’s gaps in knowledge, and determination to pursue knowledge when he needed it, is perhaps not so extraordinary after all. Doesn’t this apply to us all in one way or another? Subjects that hold no interest bore us; subjects that fascinate us give us a thirst for knowledge. Margaret Thatcher and Ronald Reagan, Harry Truman and Abraham Lincoln, all exhibited great gaps of knowledge. But when it mattered, they sought out and grasped what they needed to know. 1 A.L. Rowse, The Later Churchills (London: Macmillan, 1958), 439. 2 Gordon Craig, “Churchill and Germany,” in Robert Blake and Wm. Roger Lewis, eds., Churchill: A Major New Assessment of His Life in Peace and War (New York: Oxford University Press, 1993), 21. Note: first appearance of the “beastly language” quote was in Adam Sykes and Iain Sproat, The Wit of Sir Winston (London: Frewin, 1965), but no attribution was stated, and we cannot find it in any Churchill archive.